The response of highly deformable architectures can be programmed to impart a series of desirable functionalities, such as extraordinary geometric changes and conformational rearrangements, highly non-linear mechanical responses, and unusual mechanical properties. One key factor that can be used for this purpose is the intentional exploitation of local instability of slender elements during deformation. 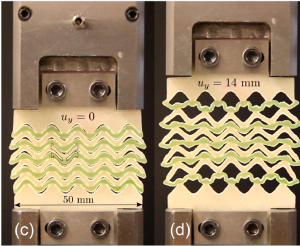 Soft metamaterials currently under investigation arrangements of snapping units with tunable response and other compliant metamaterials which simultaneously exhibit extreme mechanical properties under reversible configurations. Rafsanjani A, Pasini D, Bistable Auxetic Mechanical Metamaterials Inspired by Ancient Geometric Motifs, Extreme Mechanics Letters, 9: 291-296 2016. 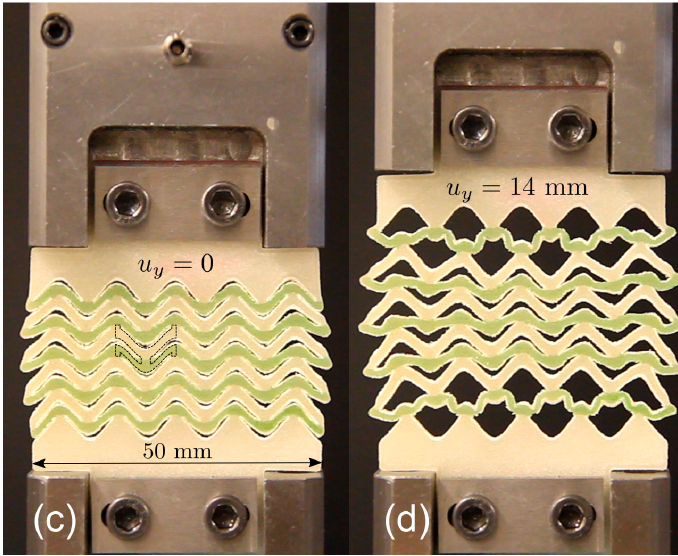 Rafsanjani A, Akbarzadeh AH, Pasini D, Snapping Mechanical Metamaterials under Tension, Advanced Materials 27: 5931-5935, 2015.